“Five…! Four…! Three…! Two…! 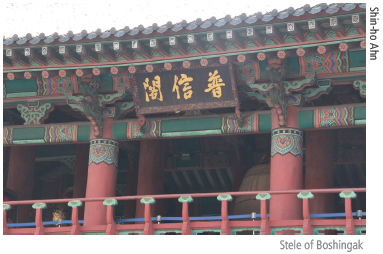 One…!” With the countdown, the bell of Boshingak tolls 12 times. The crowd around Boshingak yells out a cheer and makes a new year’s wish, praying for everyone’s good luck for the year. This new year’s scene has been a tradition since 1929 and is repeated every year. How can we hear the sweet sounds of the bell continuously? There is a man who manages the bell for this precious event. 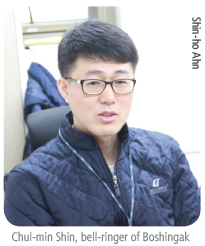 The UOS Times had an interview with the bell-ringer of Boshingak. 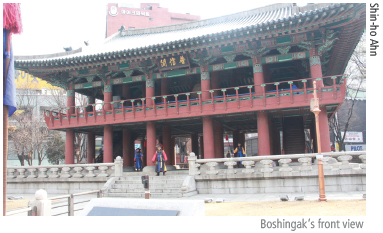 Boshingak: A large bell pavilion on Jongno in Seoul. 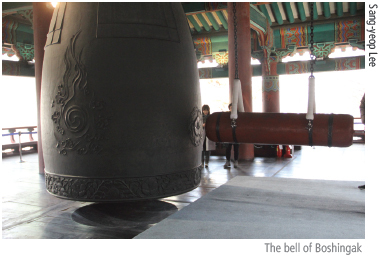 Chul-min Shin, the Action Officer of History & Cultural Division of Seoul, has been the bell-ringer of Boshingak for ten years. When The UOS Times visited Officer Shin, he was holding a bell-striking event which he prepares for every day except Monday. The event allows the public to experience bell striking on their own often with special Korean traditional costumes like Hanbok. This event is popular, especially among foreigners who are curious about Korean culture. After the event, we followed him to his office and started the interview. utBell-ringer might be an unfamiliar job to college students. Would you explain what the bell-ringer does? First, you should discard your dreams of becoming the bell-ringer. (laughter) This is a kind of family business. Only the one who inherits it can become the bell-ringer. I also inherited this career from the 4th bell-ringer, my teacher. My teacher tried to turn it over to his son, but his son was running a business. Therefore, I became the 5th bell-ringer. You made totally new events, right? My teacher said he wanted Boshingak to remain in people’s memory for a long time, and I think involving people in activities helps make that happen. Did you also develop the bell-striking event that you do daily? [No], when the event was developed, I was not the bell-ringer, but only taking charge of the direction. After becoming the bell-ringer, I made a bell-striking ceremony for Children’s Day, wishing for their healthy lives. There will be a Joint Memorial Ceremony during Seollal and Chuseok starting this year. You have been the bell-ringer for ten years. You must have seen lots of people during the events. Is there any person that remains in your memory? A person who was suffering from cancer came to participate in the bell-striking event to pray for her recovery. And after that, she came back to me with some drinks to say thank you. She recovered from her illness. Don’t you feel it burdensome to inherit the job and keep it alive? If my teacher were alive, I might be able to take a big load off my mind. Of course I learned a lot from him by being scolded, and I felt too much pressure when he passed away. At first I asked myself, “Why I am doing this?” Then one day, I thought differently. Many people asked me, “Isn’t it [the job] over?” My answer was no. My teacher’s grandson is now 20. I will hand this over to him. This makes the job stay alive. I am a temporary bridge for this generation. In another interview, you said, “I can feel whether there is a problem with the bell by just knocking on it lightly.” How much did you try to reach that stage? I feel so flattered by your saying “reach that stage.” In the past, my teacher said, “You should commune with bells by sharing each other’s feelings.” He had rung a broken bell, and he said it is different when striking a unbroken bell. For that reason, I try to feel the bell. Before each event, I strike the bell with a bell pounder very softly. The sound is silent, but I can feel whether it has a problem or not. And this is also good for the bell since it gets warmed up. When you hug the bell and feel the vibration, it is cold of course, but also cozy. Perhaps it is because I have a strong affection toward the bell. I think my teacher was right. These days, it is hard to find students who want to dedicate themselves to such jobs which do not look fancy. What do you think about that? Those jobs which they think are inferior might disappear without self-sacrifice and responsibility. My ancestors [the former bell-ringers] could have worked with better status and in better environments, but they accepted it as their fate. I have also accepted it. I am 43 years old, and belong to adults. Think about what you really want to do, and start at the bottom with that. Then those jobs will not fade away. Can you give some advice to the students of UOS? Please struggle a lot and keep challenging yourself. There is a big difference between people who have experienced failure and those who have not. You can acquire competence in overcoming hardship. Everyone says “patience and effort,” but it is hard to put into practice. You are young! Do not give up! There are many students who are being discouraged just by one failure. Conditions in society can make you disappointed, of course, but try developing a spirit of challenge. And finally, change the given conditions!